Why table Position matter in Texas Holdem poker? Poker is an interesting game, whether played online or offline. For those who have been wondering what is Texas Holdem poker, it is a cash game played on a table with opponents locked in a battle of skills with you. You can monetize optimally by utilizing your strategic table position and keeping your senses receptive to the changes occurring on the table. Among the uncountable tips to win in Texas Holdem, one of the most important is to factor in the table position and outflank your opponent. But how table position works? As you settle down at the poker table, you need to have an eye for the small white disc that indicates the identity of the card dealer. You need to immediately figure out your table position w.r.t. order of betting. Small and big blinds are 1st 2 seats on the dealer’s left. Betting is started with a fixed amount. Next, the betting action starts moving clockwise around the table. Each player strategies on his moves based on the sitting order. The idea relates to playing strong hands in initial position, good hands while midway and some better hands later on. The player sitting on big blind’s left is ‘under the gun’ who has to act first. Table’s overall size determines the ‘early positions’ which usually are for players occupying the left and subsequent seat. This position is the toughest to play as the player is unaware of the moves of remaining participants. To optimize on the early table position, you should invariably play the strongest hands which usually are 2 10s pairs, ace and king or queen, or higher. Proceeding with table position on Texas Holdem, the few seats next to early position are favourable as one can get a feel of the intentions of the first few players. You can enrich your repertoire in this strategic position by adding some more suited connectors and tactical pairs. The importance of mid position can be realized fully in the hijack or very next seat, which lies between mid and late positions, by raising with any pair. This position is undoubtedly the best in Texas Holdem. You become thoroughly acquainted with the moves of remaining players. You can take home the pot even with an average hand of the rest of players have folded. You have the opportunity of raising with more card choices and every suited connector such as any ace for same suited card. 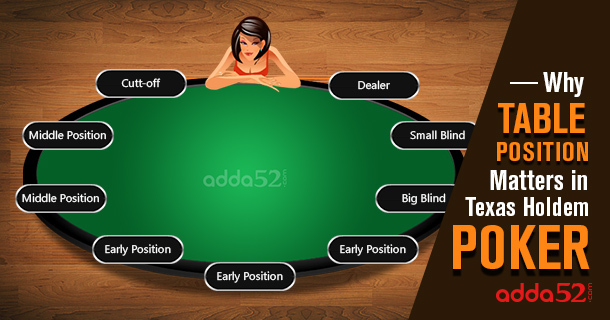 When the action returns back to blinds, you need to check of most of the players have called as you may then call with an array of hands that you would usually play with in the late position. In the event of a raise, adhere to the early position’s initial hands. If no player has raised till now, you may consider raising with good hands. The table position related tips to win in Texas Holdem are vital and must be understood thoroughly. Folding or throwing away the cards, calling or putting in the cards similar to the previous bet or similar to a big blind in the event of no one raising yet, or raising i.e. betting with an arbitrary amount provided that it is not less than twice of the previous bet? If your cards are still strong, you should consider raising the pot to 3- 4 times previous bet to win large sums of money. This would also induce weaker hand players into folding and leave fewer players on the table. If a player has raised ahead of you, call. If you hand is stronger like jacks, ace and king or queen, then consider raising. If no player has raised, consider raising or folding. You must have gotten thorough insights into the importance of table position in Texas Holdem. Happy playing!! !.